These are the first words you hear when you step into the beautiful world of Final Fantasy 14: A Realm Reborn. 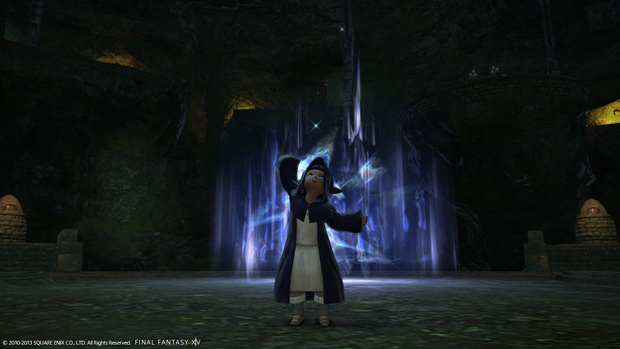 Final Fantasy 14 has had its ups and downs to say the least. After its first release in September 30, 2010 failed miserably, it was brought down a year later (November 11, 2012) both at the request of players and developers alike. Most games don’t get a second chance, but A Realm Reborn proved why some games deserve it. With a brand new engine, redesigned combat system, and a beautifully developed world, A Realm Reborn is now one of the best Pay to Play games on the Market. Featuring the ability to switch to any job at any time, an immersive world to explore, and story quests for not only the main story, but each and every job, Final Fanatsy 14: A Realm Reborn has a glorious story to be told. Final Fantasy 14 has five races and over eight classes, not including sub jobs, to choose from and even more coming with future updates. Depending on which class you choose, there are three different cities your character can start in. The class you pick in the beginning does not have an effect on what class you can eventually become. I found Gridania the easiest to move around and find everything in, and Limsa Lominsa the hardest. Visually, the character creation menu is one of the best I’ve seen. I could spend hours just creating different characters without stepping a foot into the actual game. 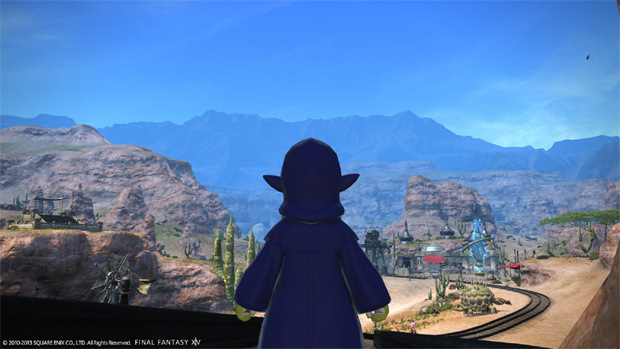 Thanks to Final Fantasy 14’s job system, once you hit Level 10 you are free to take the airship to a new city and visit one of the guild locations to switch classes. Once you have more than one class, not only can you easily switch by changing your weapon, you can also bring certain skills over to your new class, allowing for even more customization of your character. This switch can be made even more painless by saving skill and gear sets for each class. Skills are obtained simply by leveling up. One thing I did notice, and didn’t like too much, was that you can view every skill your class can get as your character levels. Although this information could easily be found online, I prefer to be surprised with the new skills I acquire as my character progresses. Character customization is also very user friendly. You can choose your standard hairstyle, eye type and color (even multiple colored eyes), your facial expression, and accessories. You also have the option to add highlights to your hair to go along with the main color. 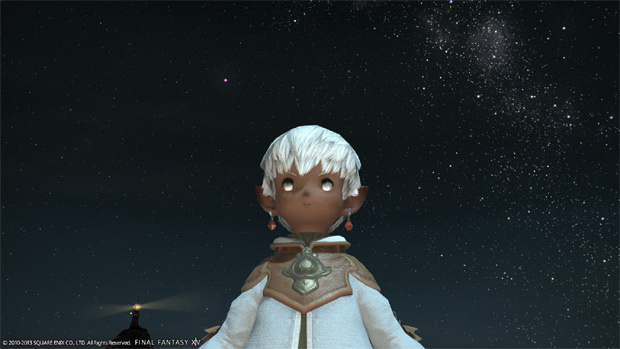 Unlike most character creation options, you also have the option to choose how big or small your eyes are, along with your height. Although the bulk of customization is based on presets rather than sliders, they at least offer enough variety to avoid seeing clones of yourself everywhere you go. The UI is also very customizable by allowing you to move around menu areas where you want and scale the complete UI up or down. The only downside to this is that you can only scale it up or down to a certain point. I hope in the future they allow us to modify this even more for those of us who enjoy more of a detailed view of the world and less UI interface without having to turn the UI completely off. There’s not much to say except that Final Fantasy 14 has some of the most stunningly and vivid environments I have seen in an MMORPG. From the details of the sky, the cities, and even the NPC’s, every part of the world looks alive and begs to be explored. The only thing I can see that could use an uprgrade is the floral environment textures, but they may be less detailed as to provide less lag for people with older PC’s. However, it would be nice to have an extra option to turn the graphics up for them. There haven’t been many games that I could turn off the UI and just bask in the realistic world view, but Final Fantasy 14 is definitely among them. The music in Final Fantasy was composed by none other than Nobuo Uematsu, who has worked on previous Final Fantasy games. There’s not much to say about the music, except that it’s absolutely mesmerizing. 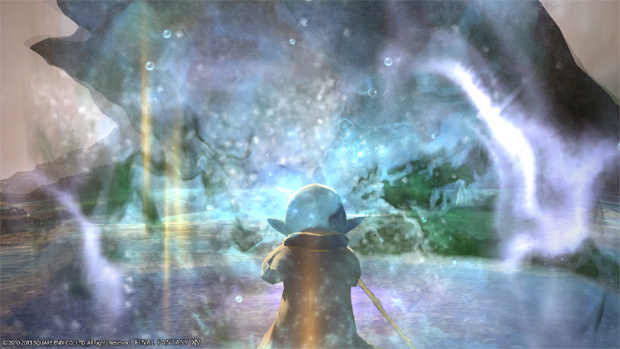 The music really makes you feel one with the world, and Final Fantasy: A Realm Reborn has one of the best soundtracks in the MMO genre. I’ve found myself listening to just the soundtrack for hours and can’t imagine it improving beyond what is in-game now. 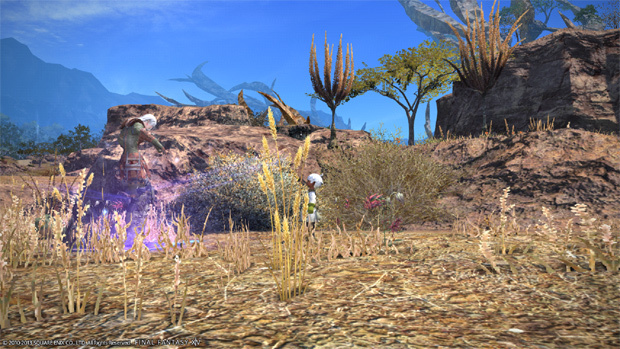 Final Fantasy 14 uses your standard keyboard and mouse controls with the option to use a gamepad controller similar to Final Fantasy 11. The gamepad controls are done really well, and it doesn’t affect gameplay very much at all. A lot of games have trouble implementing controller support (Dark Souls PC Port, anyone? ), but as I tested it, I found it just as easy to use as a mouse and keyboard setup. Oh, the wonderful world of gaming communities! You always have that bad bunch of players who refuse to communicate, help out, and just bash every single thing you say or do. Final Fantasy 14’s community is, for the most part, one of the best I’ve come across. This might be due to the IP of the game itself, but anytime I had a question, I just posted it in Shout and there was always someone to quickly reply with an answer or offering to help. As the game has progressed into maturity over the past few months, this has seemed to only improve as the patient gameplay style and subscription model has weeded out a lot of the undesirables from the pool. 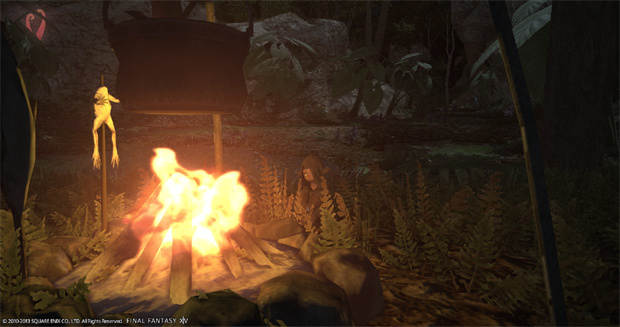 A Realm Reborn’s gameplay is similar to most point and click MMO’s out today. Although some would say that this type of control scheme is outdated, as most games are moving towards action oriented combat, I would say that with Final Fantasy games, you almost have to go this route. Since a flash of the screen and turn-based combat wouldn’t work too well in an MMORPG of this scale, I found that the point and click combat system of Final Fantasy 14 was done very well. 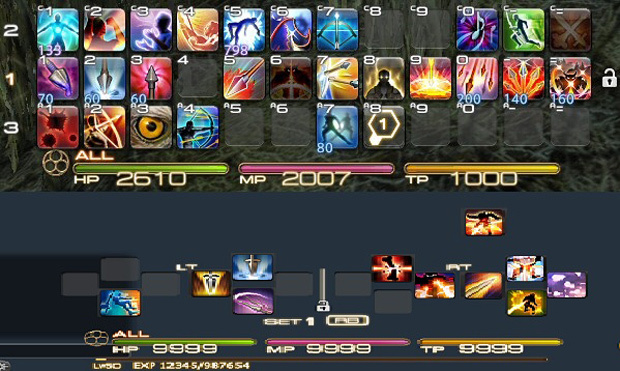 You have twelve skills available per hotbar, and you can add up to three bars total. The monsters in Final Fantasy also have their own skills, and will switch up their strategies depending on what you’re doing. When a mob is using a certain attack, you’ll see a red indicator in the area it’s going to effect, giving you time to move out of the way. This means that you have to be aware of your surroundings. You can’t just sit back, spam your skills, and browse the interwebs, because it’s very likely to get you killed, especially during boss fights. 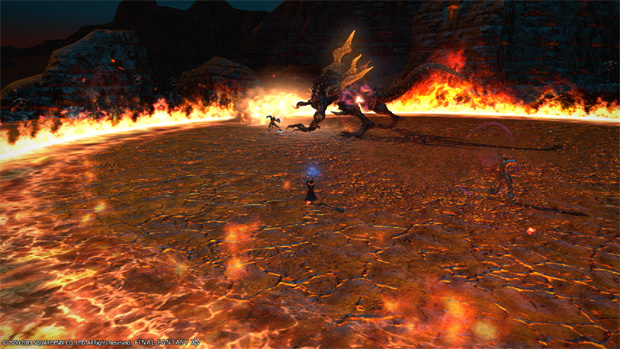 My party was wiped out several times during our first run-in with Ifrit before we found out exactly how to dodge his hellfire attack. Regardless of how many times we died, it was a very fun battle, and I loved the challenge of it! 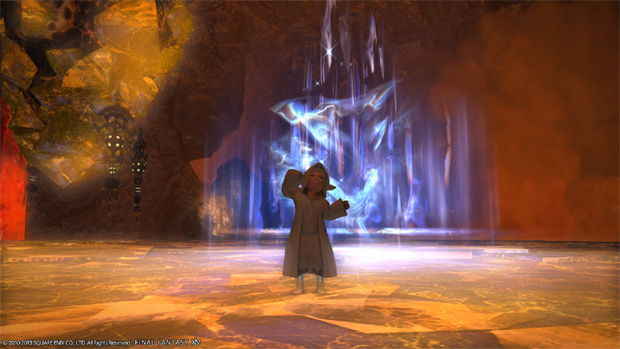 Dungeons in Final Fantasy are very interactive and fun to explore. There are items hidden everywhere, and they even throw in some fun puzzles in order for you to progress. Some dungeons take a lot of cooperation to finish, which gives players a reason to group up to make their objectives easier to complete. Dungeons could use a bit more interactions and puzzles, but other than that, they’re fun and almost as gorgeous as the outside world. With Patch 2.1 releasing on December 17th, two PvP modes will be introduced. There are three types of Levels for PvP; 30, 40 and Level 50. The battles will be fought 4vs4 and there will be some exclusive skills to use only for PvP. This will keep things balanced and separated from PvP and PvE. We’re not sure how balanced it’ll be right after the patch comes out, but as always, balance issues will be watched and changes will be made accordingly. The bright side of this system is that when those balance changes do arrive, we can rest assured that our favorite class won’t be nerfed into oblivion in PvE just to level them out in PvP. 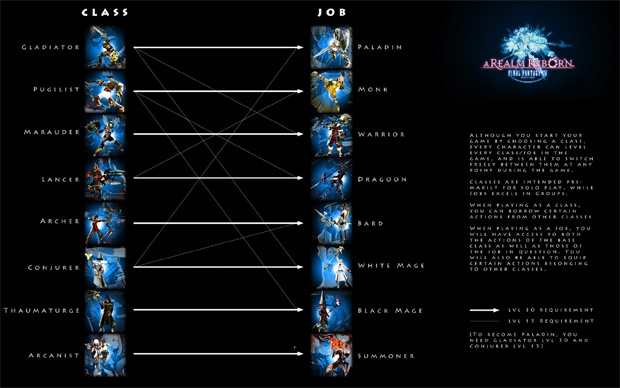 Guilds in Final Fantasy aren’t called guilds. Instead, they refer to them as ‘Free Companies’. Once you create a Free Company you can manage it from the easy to use Free Company Menu. Not only can you create and choose ranks for members, but you can also customize the names for each rank if you’d like to change them from ‘Recruit’, or ‘Captain’, etc. Free Companies can rank up as they do company quests. Leveling up in rank gives the Free Company even more options such as a Company Chest, Company Crest (logo), all the way up to Rank 5. At this latter rank, Free Companies unlock Free Company Actions that can be activated by the Free Company Leader. These actions range from increasing the amount of exp earned from certain battles, gathering resources, and even perception, which increases what you can see. Final Fantasy 14 has a lot going for it. If they continue pushing out updates and expansions, I see no reason that it won’t last as long, if not longer, than Final Fantasy 11, which is still going strong to this day. I do, however, believe that they should release a new class as soon as possible due to the fact that most players that played pre-A Realm Reborn have most classes maxed out, giving them not much to do except for maybe grinding dungeons and socializing. If you are looking for a MMORPG that has an interesting storyline, wonderful graphics, and enough to keep you hooked for years to come, Final Fantasy 14 would be a great choice. With the eight classes, even more sub-jobs, and plenty of story quests to keep you entertained, there isn’t much else on the market that offers such an immersive voiced story and hard dungeons to keep you going for hours on end. 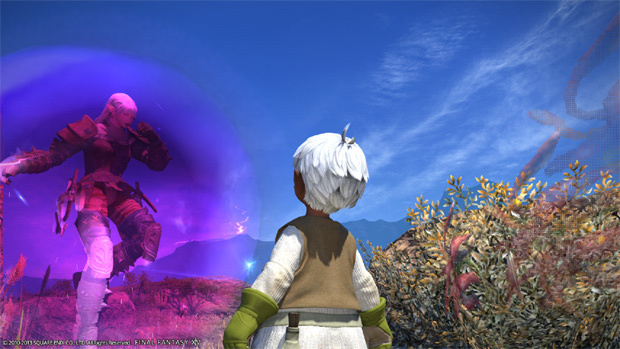 With Final Fantasy 14, it’s easy to lose track of time- I know this from experience. Some would argue that Pay to Play is over with, but with Final Fantasy 14’s sheer amount of content, they can take my money every month as long as they continue updating us with even more content patches and new things to do. Did I mention they’re bringing in the Golden Saucer sometime soon?! What more do you need from a Final Fantasy MMO? A special new update introduces players to the dark powers of Kanna in MapleStory. Continent of the Ninth Seal (C9) has released its latest content update, in which a new Awakened Level System is introduced to C9 enthusiasts.